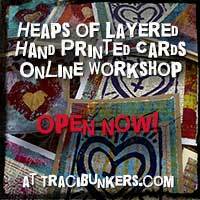 All contents of this blog and site are Copyright © 2007-2015 Traci Bunkers: Bonkers Handmade Originals. All rights reserved. US Copyright Law protects this content above and beyond the Creative Commons license also in use. Except where otherwise noted, some content on this site by Traci Bunkers is also licensed under a Creative Commons Attribution-NonCommercial-NoDerivatives 4.0 International License, which allows it to be shared online with restrictions. Other authors and artists on this site retain all rights. Content not included in the Creative Commons License may not be shared or redistributed and is fully protected by US copyright law. See Conditions of Use for more information on how my collage sheets, patterns, and rubber stamps can be used. Blog posts: An excerpt may be shared with one (1) image or video, linking back to the full post. The post in its entirety may not be shared. Tutorials: An excerpt may be shared along with one (1) image or video, linking back to the full tutorial. The tutorial in its entirety may not be shared. Shop images and text, not actual item: An image along with the description. 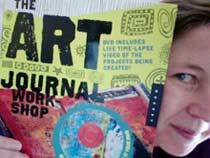 Images and videos that are not part of workshop content or digital downloads. Images and videos from workshops and digital downloads that I have used for promotional purposes, such as in blog posts, in my shop, or in a sidebar. Graphics and buttons that I have created, promoting one of my products, workshops, or events. Attribution — You must give credit by using my name and a hyperlink to the original location on my site where you found the content. Credit needs to be clear, not so small that it’s unnoticed, and not in any way that suggests I endorse you or your use. NonCommercial — You may not use the material for commercial purposes. Sites selling things are considered commercial. NoDerivatives — You may not remix, transform, or build upon the material. These conditions may be modified with permission by Traci Bunkers: Bonkers Handmade Originals. Violation of the copyright will be pursued. If you are not sure whether it’s okay to share something, or if it’s okay to share it in the way you want to, just ask.